Form a circle of couples as illustrated below, every other couple facing along and against line of dance, forming sets of two couples facing each other, perhaps after a Grand March. These figures are noted in the sources as having been taken from the first figure of the Plain Quadrille, which helps in the reconstruction. Right and Left (8 bars): Cross over to opposite places, with each Follow passing between the opposite couple. Each Lead touches right hands with the opposite Follow in passing (optional), then takes his partner's left hand in his left and turns her halfway around to face back toward their home place (4 bars). Repeat to return to home place (4 bars). Balance to Partners and Turn* (8 bars): Advance to partner, retreat (4 bars). Advance to partner, turn partner, and retreat (4 bars). Ladies Chain (8 bars): Ladies take right hands and cross over, giving left hands to their opposite, who turns them by the left to face in again (4 bars). Repeat to return home (4 bars). * While the other figures were easy to reconstruct, this figure was somewhat of a puzzle. The problem lies in the fact that there are many possible interpretations of the word "balance." "The couples advance and retire (four bars) and then turn partners (four bars). In turning the partners join both hands, holding them downward and slightly extended, and walk round each other to the left, describing a circle." "Partners face each other, and each gentleman crosses hands with his partner, placing the right hand above the left. The two couples then slide to the opposite sides (four bars) and back (four bars), passing to the right." "The lady and gentleman stand sideways, take one hand, walk three steps forward and three backward, and then turn partners." Initially, I chose #2, based on the fact that "balance" is described that way in the Plain Quadrille chapter of Hillgrove 1857 and Wilson 1899, books which feature detailed descriptions of the Plain Quadrille along with descriptions of the Sicilian Circle, and tell you to apply the former to the latter. This interpretation also seemed reasonable based on the fact that Hillgrove references "rude" dancers replacing this figure with a chaotic galop around the room (see below), and if there isn't a galop in the second figure, there isn't a galop anywhere in the dance. This would mean that instead of just playing with the form of the dance, the "rude" dancers completely subverted it, which does indeed seem a bit rude. (Perhaps that's why Hillgrove seems so worked up about it, rather than applauding his dancers' creativity.) But in choosing option #2, I had to completely ignore that most sources reference turning one's partner after the balance, and that several sources reference balancing "to" partners, neither of which the galop allows. And that seems a bit rude of me as a reconstructor. So in the end, I've gone for a more literal interpretation of balance to partners and turn. It makes the galop substitution a bit more puzzling, but it seems more in line with the original descriptions. In addition, I initially had Hillgrove's once and a half promenade as the primary version of Part IV, but later discovered that passing through seemed to be the more popular version. When Part II is Balance and Turn, and Part IV is Forward and Back and Pass Through, the even parts have a nice symmetry to them, which further reinforces both choices. In The Scholar's Companion & Ball-Room Vade-Mecum (1857), Thomas Hillgrove writes, "This dance was formerly a great favorite at all public balls, but is now very seldom danced, on account of the rude manner of performing it. For, instead of setting to their partners and turning in places, or passing ones and a half round in the promenade, the majority of our rude dancers rush off with a gallop, sometimes passing more than half the length of a ball room, and are frequently at a crowded ball unable to find the places where they left off. When properly danced, however, it is a very social dance." While the stuffy dance master may find it rude, 19th as well as 21st century dancers may find it quite fun. As Hillgrove describes, galops anywhere in the room replace Parts II and IV. In place of the Balance to Partners and Turn, galop anywhere in the room and return to places. In place of the Promenade, galop anywhere in the room, and return to new places, having progressed one position to the next couple. Any square, energetic, walking-tempo tune will do. Several descriptions specify that the dance is in 2/4, so "8 bars" above can be interpreted to mean 16 counts. The Sicilian Circle #2, #3, #4, etc. French 1893 notes that "Variety may be afforded by adding to 'Turn partners' the other way," or using Schell's coda. Alternatively, he notes that "after considerable experience the prompter may vary the changes as follows [see below], thus giving a new figure entire, at which point the original figure can be resumed." He also adds that during the even numbered repetitions (second, fourth, sixth times through, etc. ), "all balance to center of the room, instead of forward and back and circle around." Though different, these versions are all equally valid variations of "The Sicilian Circle." Yes, it's a mess, but a beautiful one. Each time the figure is repeated the dancers will all face a new couple, and the dance is finished at the option of the master of ceremonies. This dance was formerly a great favorite at all public balls, but is now very seldom danced, on account of the rude manner of performing it. For, instead of setting to their partners and turning in places, or passing ones and a half round in the promenade, the majority of our rude dancers rush off with a gallop, sometimes passing more than half the length of a ball room, and are frequently at a crowded ball unable to find the places where they left off. When properly danced, however, it is a very social dance. MUSIC IN TWO-FOUR TIME - Four Parts. 1. Right and Left - 8 bars. 2. Balance to partners, and turn - 8 bars. 3. Ladies' Chain - 8 bars. 4. All promenade - Passing once and a half around, and finish facing the next couple, with whom the same figure is again repeated - 8 bars. Each time the figure is repeated, the dancers will face new couples, and the dance is ended at the option of the Floor Manager. This dance was formerly a great favorite at public balls, but is now very seldom introduced, on account of the rude manner of performing it. Instead of setting to their partners and turning in places, or passing once and a half around in the promenade, the majority of rude dancers move hastily off with a gallop, sometimes passing more than half the length of a ball room, and at crowded bails are often unable to find the places which they left. When properly danced, however, it is a very social dance. Two Couples: Right and Left Across. 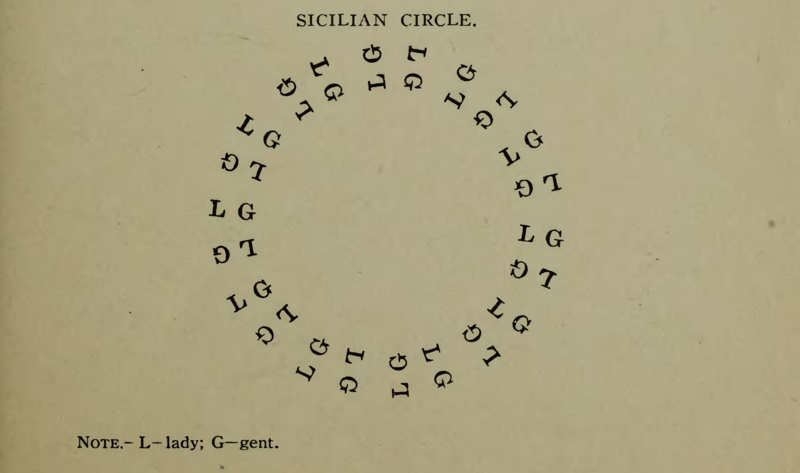 The Sicilian Circle is formed in couples facing in a circle around the hall. The first call is given before playing. Four hands round (4) ; turn partners (4) ; right and left (8) ; ladies' chain (8) ; all forward (4) ; pass by (4). All balance partners (4) ; turn partners (4) ; promenade round the hall (8). On an engagement the Grand March will probably be the first number on the programme. The floor manager will generally give you the signal when to start and finish. The march should be played moderately slow. If the Sicilian Circle follows, at the finish of the march, say "Please form for the Sicilian Circle; every other couple face about." After they are formed upon the floor properly, call the following changes, the music and dancers starting together. The figures denote the number of measures required to execute each change. Circle four hands around ; turn partner ; right and left ; ladies chain ; all forward and back ; pass through . The above completes the figure, and, after "Passing through," the dancers all face new couples. Repeat this order of changes several times. Variety may be afforded by adding to "Turn partners" the other way , and at the finish, call "All balance partner" ; turn partner ; promenade around the hall for the last eight measures. After considerable experience the prompter may vary the changes as follows: All cross right hands half around ; left hand back ; ladies' chain ; all chasse to the centre of the hall and back ; forward and back ; pass through ; thus giving a new figure entire, at which point the original figure can be resumed. Formation - Two couples facing all around the room. The first call when music begins. All forward (and back) ; circle (four hands) around ; ladies' chain ; right and left ; forward and back ; pass through (face next couple) . Note - Second and fourth times, etc., all balance to center of the room, instead of forward and back and circle around. In this dance the sets are arranged exactly as in the Spanish Dance. The movements are adapted from the Plain Quadrille, and the music is in 2-4 time. 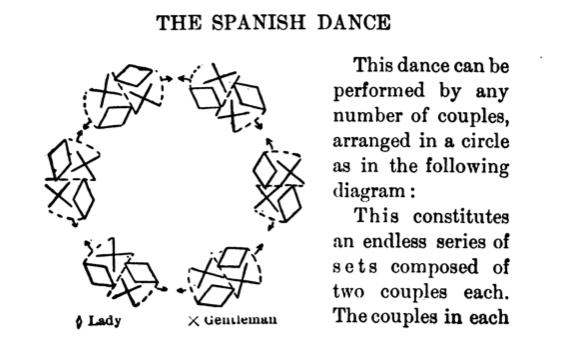 For full description of movement see first figure of Plain Quadrille.